Christmas is the most famous holiday of the year, and the word itself evokes images of Santa Claus, Christmas trees, lights, the baby Jesus, and, of course, presents. Instantly, well known Christmas carols ring in your ears, or maybe you even picture nutcrackers or Scrooge and Tiny Tim. Christmas has been popular for centuries, and it only continues to get more popular today, with Christmas season extending months in advance of December 25. And though much has been written of Christmas, its exact origins are still mysterious. Historians are unsure what date Jesus was born on, or whether Christmas Day coincides with previous pagan holidays. Regardless, Christmas is always the perfect time for holiday cheer, and reading classic Christmas stories like A Christmas Carol or Twas the Night before Christmas. 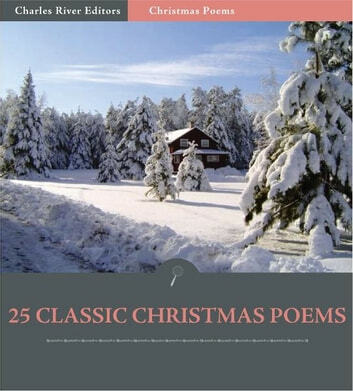 This collection of Christmas poems includes poetry written by some of the worlds most famous poets and authors through the ages, ranging from religious subjects to the whimsical. It is specially formatted with a Table of Contents and is illustrated with over a dozen Christmas-related pictures, including Christmas trees, the Nativity Scene, Santa Claus, historical depictions of the holiday, and more.